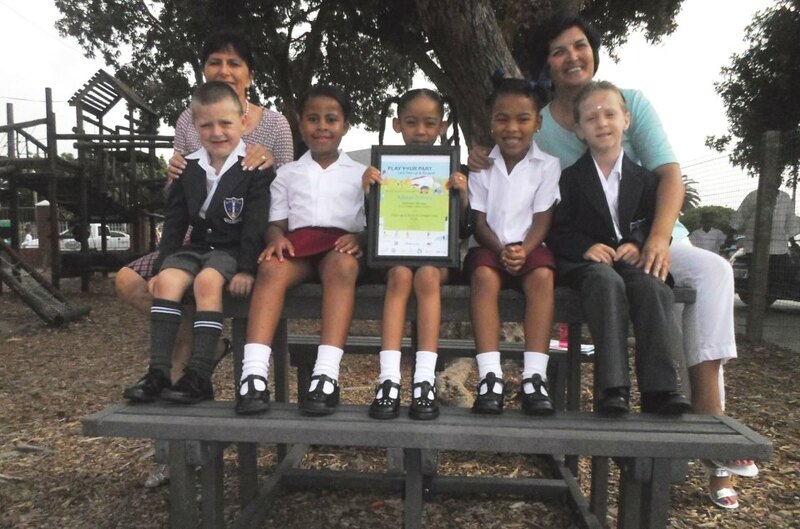 Grade 1 pupils and teachers sit on the new picnic bench made from recycled plastic that they received as their prize in Plastics SA’s Schools competition, whilst proudly showing off the certificate they received. Kabega Primary School in Port Elizabeth has once again proven their mettle as a group of learners committed to sustainability and cleaning up their environment, by emerging victorious in Plastics|SA’s annual Clean-Up and Recycle Competition. According to Jacques Lightfoot, Sustainability Manager at Plastics|SA, the aim of this yearly competition is to encourage, schools, organisations and the public to involve their friends, family and communities in a clean-up or recycling activity. “We required the entrants to supply us with a short report and photographs of their initiatives as part of our Clean-Up and Recycle SA Week activities,” Lightfoot said. This event was sponsored by Plastics|SA’s Sustainability Council, Pioneer Plastics and Tufflex and offered exciting prizes that were up for grabs, including cash prizes, a 6-seater picnic table and a 3-seater bench made from recycled plastics and a four-in-one recycling station. Entries for this year’s competition came from schools around South Africa. “We judged the entries based on how many participants were involved in their respective projects and whether they managed to involve their community. Kabega Primary was a clear winner and stood out for us because of the amount of recycling and other environmental and sustainability work it does. It is an amazing school that is clearly dedicated to making a difference in their environment as they organized clean-ups in Baakens River Valley, Willows and Seaview,” Lightfoot said. The school received as its prize an award certificate and a bench made of recycled plastic which was placed in the Grade 1 area of the school, in order to make the little ones aware of the school’s green emphasis. Vaalpark Primary came second in the Primary School Category, and Louise Van Tonder was named the winner in the Organisation Category. “We were once again unbelievably impressed with how industrious, creative and motivated the young people can be when it comes to bringing about real and lasting change in their environments. We wish to extend our congratulations and compliments to every entrant on their exceptional effort and look forward to next year’s entries,” Lightfoot concluded.